A karma bracelet may be the answer for people searching for symbolic jewelry with a motivational message. Anahata Jewelry makes bracelets that help people realize certain life goals. LoveToKnow Jewelry recently sat down with Anahata Jewelry designer and company founder, Puja Seth, about her inspirational jewelry. Puja Seth began designing yoga inspired jewelry after a life changing experience studying yoga with a yogi in the Himalayas. Her reverence for yoga and the symbolism and healing powers of many different gemstones inspired her to found Anahata Jewelry. She strives to communicate the messages and power of yoga through inspirational jewelry. 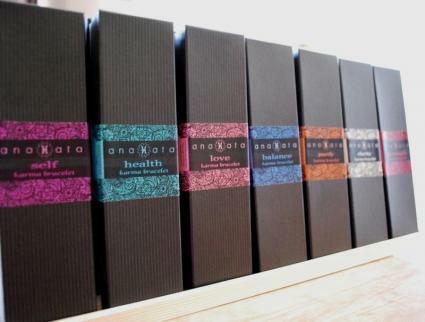 Anahata Jewelry creates a line of karma bracelets that symbolize life qualities, emotions and levels of self-awareness such as love, strength and clarity. The bracelets are designed to be worn with a specific goal in mind, symbolized by the bracelet, as a reminder of the goal. The bracelet is worn until it falls off, which means the person has already achieved the goal and no longer needs a reminder. Each karma bracelet is handcrafted and blessed in the Himalayas. Puja Seth wants to inspire others through her jewelry and share the life transforming power of yoga with a sense of fashion and style. LoveToKnow (LTK): How did your yoga study in the Himalayas inspire your jewelry designs? Puja: When I studied in the Himalayas we studied many ancient yogic and healing techniques, one being the work of crystal therapy. Yogis have long used gemstones to balance internal energy and though I was quite skeptical, I gave it a try and to my astonishment, really felt the effects of the gemstones. So naturally, I wanted to bring more gemstones into my life, but as I went out in the market to find pieces, I couldn't find any pieces that I could wear with all my outfits. I love to dress up, but I really love having pieces with deep meaning and purpose. I initially began designing jewelry for myself that could give me both; blending Californian chic style with Yogic wisdom and healing. LTK: Before the trip to the Himalayas, did you explore jewelry design? Were you always interested in designing jewelry? Puja: Funny enough, not really. My deepest passion was creating things that inspired self-awareness, in others and myself. I always looked to see how we, as a global community, could use everyday things, to enhance our own self-awareness and bring a higher quality of living to our experience, by keeping our attention on our intentions. I realized is the simplest things, like jewelry, clothing, food, skin care, have the greatest effect on our everyday experience. LTK: What is the founding story of Anahata Jewelry? Puja: When I began getting interested in healing jewelry and not finding any designs that were suitable to wear with both my cocktail dress and jeans, I began designing pieces that carried the same deep meaning, but with more aesthetic appeal. I wanted to pass along the healing stones to my friends and family, but most of them were a little skeptical. It made me realize that I had to really bring out the beauty and simplicity of the designs so they would wear it for the fashion appeal and soon would begin understanding the energy of the pieces as well. So, that's how I began designing Anahata Jewelry. My vision is to bring a deeper meaning to life, but through beauty and style. LTK: What message do you hope people get from your jewelry? Puja: My hope is to inspire people to bring more self-awareness to life. I hope that these simple pieces can serve as delicate reminders to live life with understanding and with love. Only when we can shift our perspective of life and the way we live, can we truly change the world. LTK: What type of gemstones and materials do you work with? Puja: We work with all natural semi-precious gemstones. We only look at gemstones with very high quality and brilliant facets because they reflect the most light and emanate strong energy. We love pairing the gemstones with gold and sterling silver to create a fresh and elegant look. LTK: How do you get ideas for a new piece of jewelry? Puja: I get inspired all the time. Looking at a sculpture of the Goddess Venus at a museum could inspire me to create a piece that's long, delicate, light and flowing. While watching the light reflect on the mountain will inspire a piece that carries a grounded energy, strong, powerful and earthy. LTK: Could you explain the concept of karma bracelets? Puja: Karma Bracelets are intended to be daily reminders to keep our attention with our intention. We tie the karma bracelet on with a specific intention. A yogi in India once told me, when the bracelet falls off, we no longer need reminding, as we are fully practicing and living out our intention. Often times we set an intention, but our focus and energy can be diverted elsewhere. So when we tie a karma bracelet on, we get to see it everyday, as a daily reminder to revisit our intention. The gemstones on the bracelets help to bring an extra energy to the intention. We've also designed the bracelets to be simple, delicate and subtle, so it's just our little reminder. LTK: How is each Karma bracelet blessed and handmade in the Himalayas? Puja: Every gemstone is hand selected by our team of artists and individually strung, tied and secured with the utmost attention and dedication. When the bracelet is finally made, a spiritual leader of the Himalayas brings the bracelets to the holy river Ganges in Rishikesh, India and blesses each bracelet with a mantra and dips them in the holy river. On many occasions I will fly back to India just to stand in the river with the bracelets as they are being blessed. LTK: Do you have a favorite jewelry design from your collection? Puja: I love the Self Karma Bracelet. I have it on right now. The Amethyst reminds me of the sky and how infinite this universe is and also how infinite my true potential is. I'm always trying to bring more self-awareness into my life and see what I can do to create more joy and freedom in my life. LTK: How many jewelry collections do you currently design? Puja: Currently our most popular collection is the karma bracelet, but we are soon to add Anahata Malas, which are meditation necklaces (with 108 beads) that can be worn during meditation or as a fabulous accessory that carries a deep personal meaning to you. LTK: What are the future plans for Anahata Jewelry? Puja: We plan on creating more jewelry pieces that blend style with wisdom and we also look forward to possibly bringing in an Ayurvedic skincare line that incorporates a whole approach to healthy living. Visit Anahata Jewelry's official website for more information on karma jewelry and Puja Seth. Customers can also purchase Anahata karma jewelry on the website. Proceeds from each purchase of Anahata jewelry go to support the Khushi Charitable Society which helps meet the nutritional, medical and educational needs of disadvantaged children in India.